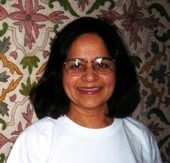 BIOGRAPHICAL INFORMATION: Punjabhai Patel was born in India and immigrated to the U.S. as an adult. He has served as a teacher, administrator and board member at SILC. BIOGRAPHICAL INFORMATION: Shanti Shah was born in India and immigrated to the U.S. as an adult. She is one of the original founders of SILC and has served as a teacher, administrator and board member. BIOGRAPHICAL INFORMATION: Chitra Subrahmanian was born in India and immigrated with her parents to the U.S. She attended SILC as an older student and now serves as the principal of SILC.